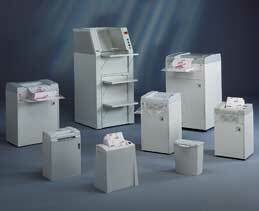 Since we have nearly 100 shredders to choose from, we'd like to make it easy for you. Simply consider a few of the features you are interested in, such as security level and capacity, then give us a call. We are fully trained to assess your company's needs and provide you with the best solution. Documents are cut into thin, unreadable pieces. Generally, the strips will be as long as the document. Documents are cut in two directions producing smaller particles and providing greater document security. If you'd like more information on the shredders before calling us, we invite you to visit Dahle's website. From there you can read about the specifics of each shredder to determine what's right for you. Then, once you've decided, call us to process your order. Not only do we service what we sell, we also offer full service maintenance.